Virtually 100% “propagation self-sufficient,” Greenleaf also operates a large bareroot deciduous tree and shrub farm for the production of high quality “liners” destined for larger container sizes. Container plants are grown and shipped to major markets (excluding the West Coast and South Florida) across the country from production facilities in Park Hill, OK, El Campo, TX, and Tarboro, NC. Our territory sales force is comprised of 24 experienced nursery professionals eager to assist you with product information, shipping advice and ordering assistance. All are Greenleaf employees, selling only Greenleaf product. 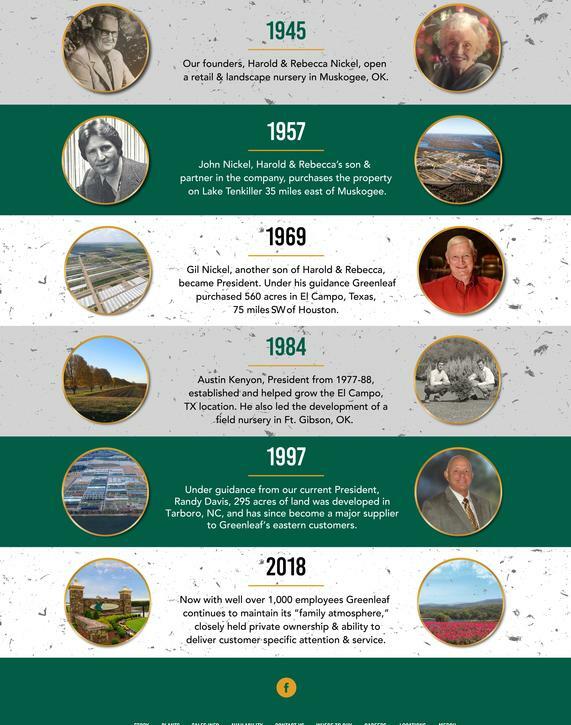 Now, with well over 1,000 employees, Greenleaf Nursery Co. continues to maintain its “family atmosphere,” with the ability to deliver every customer specific attention and service. Thank you for your interest.